Karla is a Delaware native, and has been practicing law in our state since 2007. 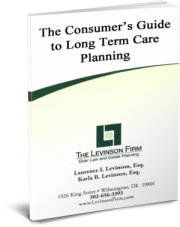 By choice and recognition of a pressing need, The Levinson Firm, LLC has focused on helping seniors and their families get quality long-term care while protecting their assets to the greatest possible extent. We understand the heartache and pressure you face if you have to make decisions about long-term care for someone you love. Nursing home care costs in Delaware range from between $8,000-$10,000 per month for a skilled nursing facility and slightly lower for assisted living facilities. Few families can handle that without help, and we invite you to contact us for help understanding all your legal options. First of all, we have unsurpassed knowledge and experience among lawyers when it comes to helping people qualify for Delaware Medicaid. In addition, we look at the big picture for every client, often finding little-known Veteran’s benefits and other resources you may not have known were available. You can talk to us about Medicaid eligibility, planning, and the overall process. We will help with estate planning and answer your questions about any aspect of long-term care insurance, taxes or other financial concerns. You can also talk to us about any other concerns you have, including how to find the best facility for your mother, father or other loved one. We get to know our clients, and we truly care what happens. You can also turn to us for help navigating every step. In fact, we complete and file Medicaid applications for all of our clients because we know current laws and procedures so well. Our staff includes a paralegal who was a former employee of the state Medicare office. We want you to feel confident and comfortable coming to our law firm for help. We encourage you to contact us and explain your situation or, if you prefer, just ask for our free elder law information in printed formats.